Fordiebianco and the serious quest for breakfast in Glasgow. If it’s autumn it must be Glasgow, so this morning I rose from my bed, showered, put on my tartan underwear and donned my best brown corduroy jacket. I grabbed The Guardian and the Ipad and started on my odyssey to find a nice full Scottish breakfast. 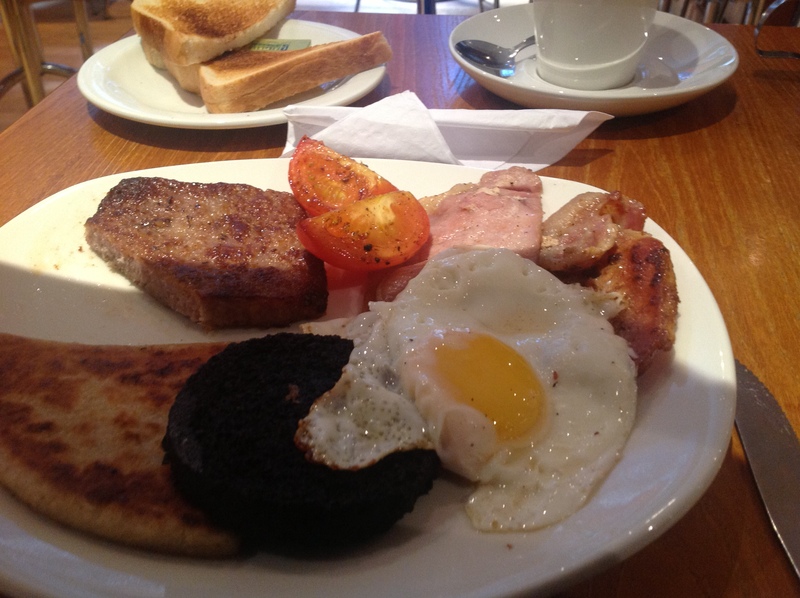 In my mind I saw a plate of toast, Lorne sausage, black pudding, beans, hash browns, bacon, maybe even some chips. When I last lived in Glasgow, the place was heaving with what the East Londoners like to call a ‘caff’. You know the place: neon lights, men with high visibility jackets, tea urn behind the counter and a menu made mainly up of fried pig’s bits. But after one hour, I still hadn’t found one. I walked up and down, East and West through Glasgow’s city centre, down the full length of Sauchiehall street, past Queen Street and Central Station, but: nothing. Loads of Prets, Costas, Burgerkings, Greggs, but no caff. I already resigned myself to sit with the middle classes in the John Lewis cafe in Buchanan Street, when something green caught my eye. There, in a souterrain on West George street, somebody served breakfast. Ok, it was far too tasteful and clean for a proper caff, but the waitresses’ Glaswegian twang was so broad that I struggled to understand anything and the word ‘Lorne Sausage’ was clearly visible on the breakfast board. And they even insisted to take your order at your table. How posh is that? Ok, so there are were neither chips nor beans, but you can’t have everything in life. The coffee was great, service cheerful and the place spotless. I would have stayed for hours, but they were playing Shania Twain on a tinny stereo, so I had to flee pretty quickly before I could have caused a Shania Twain triggered incident. So 3 out of four stars for breakfast, location and service, but nil points in the background music category.